Wilton Perfect Results 1725 by 115in Nonstick Cookie Pan - Large is currently selling at $10.80, approximately $0.87 higher than average. With a lowest price of $6.79 and an average of $9.93 it is selling on the high end of its usual range. Price volatility is 5.5% (meaning it changes a few times a week), so the price may drop reasonably soon. Right now this product is a recommended 'wait'. 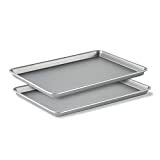 Compare the current price, savings (in dollars & percent) and Buy Ratings for the top Baking Sheets that are closely related to Wilton Perfect Results 1725 by 115in Nonstick Cookie Pan - Large. 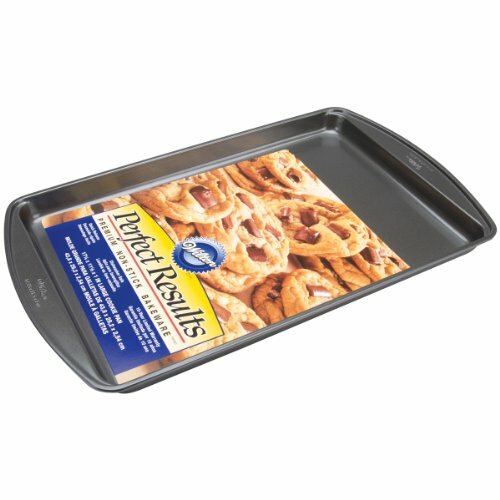 Here is how Wilton Perfect Results 1725 by 115in Nonstick Cookie Pan - Large compares with other leading Baking Sheets. To bake your favorite food to perfection, start with Perfect Results premium nonstick bakeware. These pans feel noticeably heavier than most comparable brands, assuring you that Perfect Results premium nonstick bakeware will heat evenly for years of baking perfection. FeaturesNonstick surface offers reinforced coating that provides quick release and easy cleanup.Convenient handles are designed for easy handling in and out of the oven, even while wearing oven mitts.Heavy guage construction that spreads heat evenly and prevents warping.Embossed pan measurements are precise pan measurements that are permanently stamped on handles for quick, easy reference when following your recipes.